One of the fundamental rights that most of us have as Americans is the right to vote and it’s a right that I don’t take lightly because I have seen firsthand an election decided by two votes. Two little votes and the course of local history was changed, just like that. When I first turned 18, my Dad made me go to the local courthouse and register as a voter and I didn’t need much persuading because I had good history teachers and they had always stressed how the right to cast a vote was bought and paid for by the blood many Americans spilled in the course of our two-plus centuries of existence. Some of those Americans were my ancestors who fought in every war our country has been a part of except Vietnam and the Gulf Wars. I was more than happy to add my name to the roll of voters in my home county. The first election I ever voted in took place that same year and I voted for Ronald Regan to have a second term in the White House because in my eyes at that time, he embodied what an American President was supposed to be….strong in action, yet considerate of all possibilities, an excellent communicator and someone who inspired me. I also voted in the local races held that year as well and took pride in participating in the electoral process that would help shape my hometown in the years ahead. To the best of my memory, I have never missed a primary or a general election since I attained the age of eligibility. I profess to be a Republican, yet I have frequently voted for a Democrat when I felt the Democrat was the best person for the job. I don’t “tow the party line” so to speak; I vote my conscience and if my conscience tells me that John Doe is the best candidate for the job, that is who will get my vote, whether they are Republican, Democrat or other. I have always believed that we should aspire to elect the best and brightest that we have and that we should not be swayed by politics. If you believe every add you see on television, then none of the candidates running for office have any redeeming qualities whatsoever and I just can’t abide that as truth. Know your candidate by researching them, look at their track record and make an informed decision based upon facts and not fiction or convoluted truth. All candidates are imperfect so it falls on us to filter through those and look past the flaws to the positive attributes. If they are an incumbent, have they been responsive to their voter’s wishes and needs? Have they attempted to cut waste, improve efficiency or bring new legislation that is helpful to the voters? If they are running for the first time, do they have past experience that will help them be effective? Do they get out there and meet people and sit down and listen to their concerns? These are things that are relatively easy to discover with the internet. How do they campaign? Do they campaign on the issues rather than just against an opponent? Mudslinging never gets anywhere with me-if anything, it just turns me against that person. Knowing these things helps me to make a decision that I can live with for at least four years. I find it appalling that so many of our younger people have become so disenchanted with politics that they don’t go and vote at all. Many times, politicians are elected to represent 100% of the people by 10% of the people eligible to elect them and this trend doesn’t seem to be reversing as time goes on. Voting is a right. In some countries, people will stand in line all day long just to cast their vote because they appreciate the magnitude of what they are doing and possibly because it’s a right they didn’t have until recently. Think about what a difference you can make and go vote. My grandfather (the one who was not the minister) once said “if you don’t vote, you don’t have bitching rights”. While bluntly put, its appropriately stated. If we don’t vote, we shouldn’t get to complain about the person who wins. 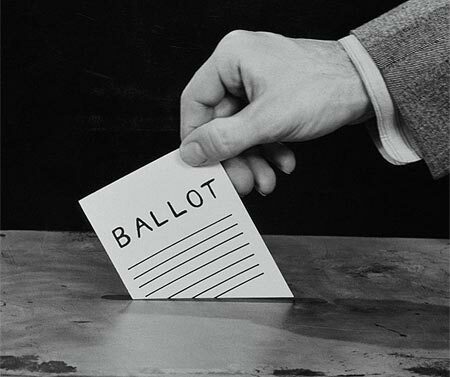 Finally, I don’t care which party you are a member of….just vote and when you do, you will have all your rights guaranteed and you can be a little prouder that you took part in a process that wasn’t always ours to be a part of, one that was fought for and is fought for even to this day. The effort to fight in a way to defend this right is a lot more than the effort required to go by your local election office….so please, think about it and go vote. Election Day is less than two weeks away and now is the time to do it! Here in the Boston area, that saying was: “Vote often and early for James Michael Curley” and many people did. The great book, The Last Hurrah, was loosely based on the last election of his life. Also look for the movie of the same name starring Spencer Tracy in one of his peak performances. He was of his day, providing jobs and machine politics for his supporters. And they loved him for it too. I am a kneejerk liberal who can’t imagine ever voting for a Republican even for dogcatcher – if that was an elected position! I have voted since the ’60s – yes, that was me writing in a pig for president in Berkeley, CA – and haven’t missed an election in all that time whither they be local or national. If I’m away I get an absentee ballot. I too have been appalled to see so many people give up their vote. Remember seeing the first election held in Iraq after the invasion? People lined up in lengthy queues for the opportunity. From the other side of the aisle I agree with my friend – don’t let the cuckoos who line up voters win the day. Be thoughtful, be serious, be voting!